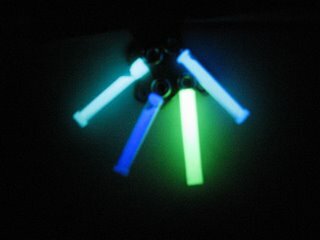 Glowstickies are very useful to locate things in the dark, if you can't get the ones filled with tritium that glow constantly for about 10 years you probably need a stick that is charged with light using glow in the dark materials (GID). To make your own glow stickies you need a container, the GID material and some small splitring or something similar to provide an attachment point. The case can be either a small acrilic tube that you can cut to the size you want, it can be a fuse or it can be the case of a mini chemical glowstick that is emptied after being used. For the GID material I use and recommend GID powder or Sand from Glowinc, the green powder/sand can glow for more than 12 hours after being charged with daylight for just 20 minutes and they are also charged with incandescent or flourescent artificial lights. They have different colors with different afterglow times. You can either fill the stick with the raw powder or raw sand or use a mixture of clear Epoxy and GID powder, in that case make sure you saturate the epoxy as much as you can with the GID powder to have maximum brightness and runtime. To seal the ends if you use the raw powder or sand you can use crazy glue or similar. A simple project to do and the materials are fun to use with no special tools required. Maybe you can give them a try. If you experiment with different media for the GID powder let me know. The Recta DS56 is a very complete compass, it's similar to many other manufacturer models so you probably can use this review for similar products of different brands. The DS56 "Global System" means the compass will be useful in both the Northern and Southern hemispheres, if you live in the Southern Hemisphere or if you travel crossing the equator in your trips you need to be careful because many compasses just work fine in the Northern half of the world and start to behave badly in other latitudes. The DS56 has declination adjustment using a small screw in the back of the compass, it offers a luminiscent bezel, a magnifier, a mirror, sight mark, coordinate scales, side scales, anti slip rubber pads and a clinometer (to measure inclintation and slopes) including a conversion table for degree and slope % in the cover top. I think the only thing missing would be a small red led or something to use it in the dark but the liminiscent material is very good so you probably don't need it. 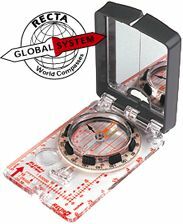 Besides having all the features you need for map navigation and some extras the best thing about this compass is that is very precise, so you can use it as the tool to calibrate other compasses you can have in your kits, specially the small button sized compasses that tend to be quite unaccurate. The DS56 retails for about $50, you can read more information at Recta's website. When the lights go out in a blackout or when daylight is not enough to see in the outdoors you need a compact, reliable and durable light that can provide ambient light to your activities. This is when a lantern is what you need. The Osram Dragon Lantern uses 4 AA batteries and can use either alkaline, rechargeable NiMH or Lihium AA batteries. It has 2 modes of operation providing 100% brightness or 25% brightness, you switch modes pushing the on/off button (max,min,off). In the 25% mode the lantern LED can go for about 100 hours of runtime, about 20 to 25 hours in maximum mode. The domed lens provides the same amount of light in every direction and one lantern is enough for a tent or a small room yet they are extremely small, about the size of 2 D batteries stacked up. The lantern has 4 small foldable feet in the base for extra stability in case you are using the lantern in a non-flat surface, in a normal table or on the floor you don't need them. There is a handle at the top to hang the lantern from a backpack, a pole or some attachment point. They can be get for about $38 from LightHound. 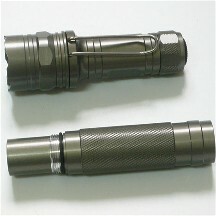 The FT-02X is a versatile 3 watt luxeon led flashlight from Huntlight. It comes with 2 bodies, one for a single C123A lithium cell and a second body for 2xAA batteries. The leds are either T or U bin leds so they are very bright and the beam is shaped to have a strong hotspot and that makes the flashlight able to light up distant objects quite well. It's not completely focused so you have plenty of useful sidespill as well. With the C123 battery you get aproximately 120 minutes of light, the first 100 minutes of constant bright light and the last 20 minutes will be dimmer. The light is very compact and pocketable in this configuration. With the 2xAA tube you get up to 175 minutes of light, 150 of flat regulated max brightness the flashlight will be bigger in this configuration but still small enough to fit a pocket. The bodies are made of HA-III aluminium, extremely strong and able to resist all kind of hits and scratches, o-rings make the light waterproof but probably not suitable for diving. The switch is a reverse clickie located in the tailcap. There is a strong and long pocket clip to carry the light bezel up. A compact flashlight that can use either lithium cells or the universally common AA batteries is a great combo you can decide what body to use based on the battery type, the size of the light or the runtime you want. It's bright, strong and compact. You can read more or order for $42 from JS Burly's flashlights. The Jimi Wallet is a small and stylish plastic wallet that can be used as a normal wallet, id holder, card holder, badge holder or to store small kits. When opened the wallet has a card holder on one side that is good for about 4 or 5 credit cards and a money clip useful for some folded bills (not many), there is no additional space for othe items, this is a wallet designed to hold just the essentials. The translucent cases are fine to flash badges or passes without the need of opening a wallet or looking for them, they have a lanyard hole in case you want to carry the wallet as a badge holder in neck lanyard. The internal money clip or the credit card holder clip can be removed if you want extra space for bills or if the clip is not useful for you, optionally you can purchase an SD card holder and use the wallet to carry SD cards too.The Jimi is also water resistant in case you were worried. There is an "x" model identical to the one reviewed here but wiht an extra clip in the outside, the clip can be used to clip the wallet to your pocket or as a money clip to carry some change. The available colors are clear, smoke, magenta, ruby, aqua, orange, green, pink and the only non-translucent color: black. They cost $15 and can be ordered from the jimi website. The pocket organizer was created to provide a way to organize what you put in your cargo pockets when you wear cargo pants. So they have been sized to fit most cargo pants pockets without problems. The organizers have a zipper to close them, when opened they have elasic straps on one side for pens and other objects and flat pockets in the other side for flat items. There are two small straps with clips that can be used for keys, a small flashlight or some other items. The pouch is flexible enough to carry some bigger items inside like a cellphone, a bigger flashlight or a PDA inside its case. 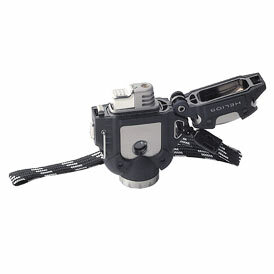 A multi-tool like a Leatherman with the spare bits will also fit without any problems. The construction is solid, both the inside and the outside are strong, the only weakish point are the small straps with the plastic clips inside but even if not very strong they are great for items that you need to access quickly and you don't want to lose. 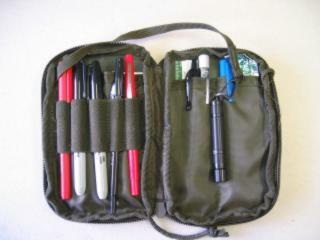 You can pull a small flashlight or a knife using the straps without opening the organizer completely. In the outside they have a velcro patch and a mesh pocket for quick access items. The organizers are strong and expand to carry as many things as you want, they are useful for survival kits, emergency kits, repair kits and others, if you don't wear cargo pants you can always use them to organize your items inside a backpack, bag or briefcase. They cost $10 and can be ordered in black, olive green or tan from CountyComm. This small magnifier is a 10x 3 element loupe, commonly used in hobbies, geology and jewelry. They are made in Belarus and are a lot better than the similar jewelry loupes you can get from other brands. The 10x of course means you get things 10 times bigger when you see them under the loupe, you may think that more power can be better but often in 20x or 30x loupes you can only magnify a very small area and you get a blurry image that shakes a lot so all the details are lost, 10x is usually more than enough for regular jobs. The lens has 21mm of diameter, 19mm of viewable area which is often twice the area that other pocket loupes offer. The focal distance is 28mm. In case of need the loupe can be disassembled for cleaning. This very nice pocket loupe can be ordered from $15 to $25 from Geo-Tools.com and they also sell a specialized lanyard to carry the loupe on your neck. 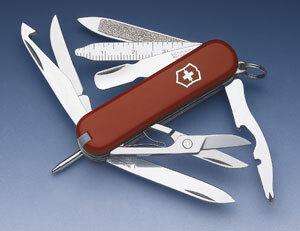 The Mini Champ is the most complete keychain sized mini SAK from Victorinox. It is just a 58mm length multitool featuring 16 different tools in a very small presentation. It has 2 different blades, scissors, nail file with nail cleaner, cuticle pusher, screwdriver with ruler, an exotic orange peeler with scraper, cap filter with a magnetic philips screwdriver, wire stripper, pressurized ballpoint pen and either tweezers or a toothpick (it cames with both but you have to choose one for the slot). Having two blades is good to keep one razor sharp in case of special needs while using the other for general cutting jobs. Compared to other SAKS these blades are smaller. Besides the orange peeler that is often used for anything but peeling oranges all the tools are good for their purpose and won't show signs of wear after a lot of normal daily use. A very good mini SAK packed of features not all of them will be used every day but the size is so small than it won't be a problem having the extra tools. If you intensively plan to use a blade you probably need another multi tool. The Mini Champ can be bought for about $30 to $40, check Froogle's links. If you want to read more about it you can visit Victorinox's webpage. 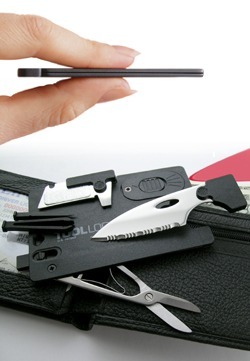 The Tool-Lite II is the most complete credit card sized multitool from ToolLogic. It features 9 different tools taking the same space as a couple of credit cards so you can carry it in your wallet or other places where you can only put flat items. It has a 2'' serrated blade that is a lot better than the blades found in other small multi tools, this one can be used for several cutting and chopping jobs without problems. Then we have a mini red LED light, a good pair of scissors, an eyeglass screwdriver, nail file, a staple puller, plastic tweezers and plastic toothpick. The tweezers and toothpick made of plastic are probably sub-par but all the other tools are good quality and very useful. Offering many useful tools in a very compact presentation the Tool Lite II is a very useful multi tool. You can read more about it or order it for about $30 from ToolLogic's website. This is a survival blanket made of mylar with a reflective surface to minimize heat loss, they are commonly known as "space blankets" since NASA was the company behind the development of reflective mylar many years ago. This blanket is 60in (1.52 mt) by 96in (2.24 mt), it can be used in several ways either as a blanket to keep you warm, as an emergency sleeping bag, to provide shelter, as insulation for a tent and for signaling. The blanket is bright orange in one side and reflective silver in the other side, the silver side can reflect up to 90% of your body heat back to you. You must be aware that this is an emergency blanket so it is just a thin layer of mylar and will not work as a real heavy blanket for your tent. 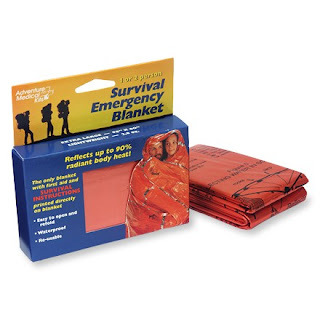 One of the most interesting features of the blanket is that it has survival instructions printed including basic survival principles, first aid tips, instructions to get water, make a fire, to build a shelter and to signal for attention. The instructions are easy to read and clear and while they are basic they can certainly a good help in an emergency. The blanket comes in a plastic case about 4x3 inches and weights just 3oz, it can be included in a backpack or kit without taking a lot of space or weight. It is large enough for one or two persons and has enough resistance for normal use but will not survive a pointy or sharp object such as a tree seed or a sharp branch. The fact that it can be used either to keep you warm or to create a shelter makes it a useful piece of gear for many environments. It is very easy to unfold but when folding you need to make sure you push all the air out or it won't fit the original package, with some care we could fold it back pushing it against a flat surface to expell the air inside in each fold. An important piece of gear that can have a big role in an emergency. You can get it for $5.50 at EDCdepot. Chemical glow stickies are used in several situations, from parties where they are fun to serious signaling in the army or rescue operations. All of them work snapping a plastic tube which makes a small vial of very thin glass break inside releasing a chemical to make contact with the surrounding media, this creates a chemical reaction that produces light for some time and then just fades away becoming unusable. There are different sizesof glow sticks, the mini glow sticks that are about 2 inches long (5cm aprox) are great for EDC kits can be used to mark milestones if you go hiking to attract attention if you are on a bike, in case of emergencies etc. They come in different colors: red, white, orange, green, blue, purple, hot pink, aqua. The runtime depends on the color and the size of the stick, the green ones are usually the ones that last longer reaching up to 12 hours of usable brightness. Please note that there are many combinations of sizes, colors and runtime, ranging from 12 hour stickies in red to 5 minutes ultra bright stickies in orange etc. It is important to know that you should keep the stickies in their envelopes protected from light and safe of impacts to avoid breaking the small vial inside them. A pack of 50 mini stickies can be ordered for $10 including 7 or 8 different colors. You can check all the available versions and order from ExtremeGlow. 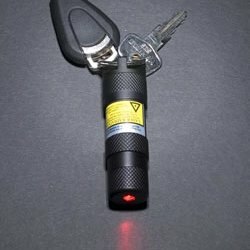 The rescue laser flare is basically a laser pointer specifically designed to attract attention in emergency situations. In case of need when you want to attract the attention of a helicopter or group of people you turn the flare on, point to the target and very slowly move it back and forth in a 5 to 10 degrees arc; the flare will then create a "fan" of light that will make it visible to the target in a wide area. To compare, using a normal laser pointer if you don't aim exactly at the target you won't be seen, with this flare it will be almost impossible not to be seen. The flare is visible up to 20 miles away on optimal conditions at night and is effective up to 3 miles in daytime. With the same technique described you can also use the laser flare to detect reflective material up to one mile away, so you can search for your rescuers while they search for you and if you are a rescuer you can search for the victims. It is waterproof up to 80 feet and runs for about 40 hours using a lithium C123 battery. The body is made of anodized aluminium and is very solid and resistant to drops or impacts. Since this is a laser you should not point it to the eyes of people and must avoid looking directly at it to avoid damage to your retina, following the instructions it is as safe as any commercial laser pointer in the market. This small item is probably a key element as a signaling device in survival kits, rescue teams can use it to detect reflective material in lost hikers or skiers that might be unconcious. Many people think that a recue helicopter will be able to see you as long as you see them but that is far from true but using this flare you can be sure a rescue plane or helicopter will be able to see you as long as you can see them and signal. The price is $88 and you can order it from LightHound. The Aunoc AAAA is a keychain flashlight powered as its name indicates by a single AAAA battery; and yes it is four A's not a typo. 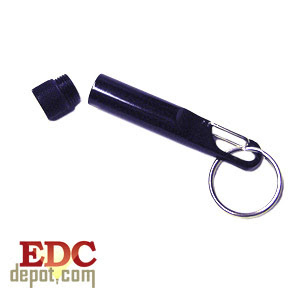 With just 67mm (2.65in) of legth and 9.55mm (0.375in) of diameter it is one of the smallest keychain flashlights you can get. The AAAA batteries are smaller and slimmer than AAA batteries but are also harder to find. To have an idea of its size think that many 9v batteries have 6 1.5v AAAA batteries inside joined by welded tabs. If you buy a duracell or some other good brand 9v battery you can open it to get the AAAA batteries and that may be cheaper or easier than buying AAAA batteries. Please note not all 9v batteries are like this so be careful. The Aunox is made of stainless steel, and is water proof to about 100 feet. The switch is just a twisty head, twist for on and off. The battery drives a single 5mm led. It is very bright for it's size and the stainless steel finish is very stylish. It is smaller than the Arc AAA but probably not as bright or strong and with a shorter runtime. 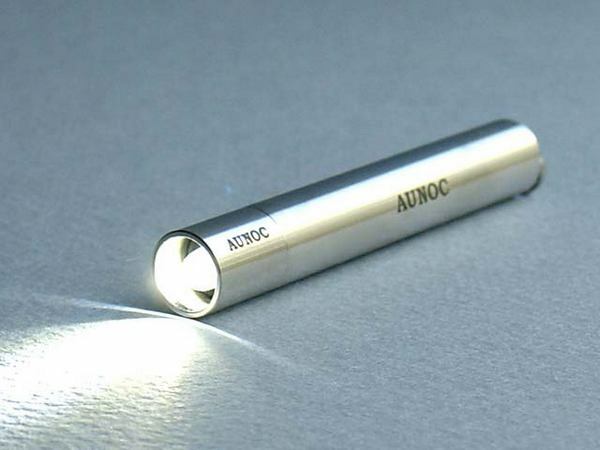 This very stylish, bright and small flashlight costs about $50 and you can order it from LightHound. The Helios is a very strong piezoelectric butane lighter from Brunton. The flame is windproof up to 80mph, you can light it up and hold the lighter out of a window in a car moving at 50mph and the flame will still be alive when you get it inside. This makes the Helios suitable for camping and survival kits as a reliable tool to start fires in the most difficult conditions. The Helios loads 1.7oz of Butane and produces a high temperature torch-style flame, a lot hotter than regular lighters. With the lid closed the Helios is waterproof, it comes with a wrist lanyard and a pocket clip on one side, the construction is solid and can resist drops and impacts without serious problems. The piezoelectric ignition should be good for up to 30,000 ignitions. A very strong and weather proof lighter that will always work in case of need. You can read more about it on Brunton's website and order it for $50 from TAD Gear. The WindStorm whistle is an all-weather strong survival whistle. It is manufactured following acoustic principles to make it very loud and it can even work under water. This whistle provides aproximately 120db of sound, it can be heard from about half a mile on the surface and it can also be heard from about 50 feet under water. The shape of the whistle is a little odd and it may be slightly big for a keychain but they are confortable enough to wear in a neck lanyard. Having a whistle that can perform in all weather conditions including under water and be heard from long distances is an important feature in any survival or safety kit, the whistle can be used to get attention with a small blowing effort so it is also suitable for children or senior citizens. 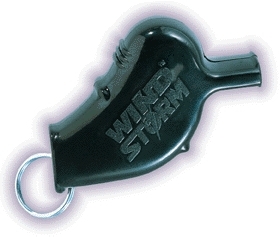 The WindStorm featured here is a more compact and sleek version of the Storm Whistle which in turn is slightly louder and bigger. You can read about the acoustic principles behind the whistle and get more information from the official website. If you want to order it Brigade Quartermasters has them for $6. The hook spy capsule is a mix between a mini carabiner and a spy capsule; since the clip is integrated in the capsule attaching the capsule to different items is very easy without even needing a split ring. The hook is slightly shorter than the regular spy capsules and it is as wide as the small ones, the large spy capsules are about 14mm wide (0.55in) while the hook is 11mm wide (0.43 in), the same as the shorter capsules. This is important if you plan to use it for pills since crushing pills to make them fit is not a good thing. Oval pills will be fine, round pills might have a problem. Built in aluminium the hook capsule has an o-ring to make it waterproof the overall length is 3 inches and the compartment is about half the size of the capsule (1.5 in). The clip looks solid and makes attachment to belt loops, backpcks or keychains a very easy task, this capsule is probably ideal to keep quick access things outside a backpack like some cash, matches, toothpicks, tweezers, pills (check diameter), salt, sugar etc. You can clip the hook outside the backpack or use it as a zipper pull with the advantage of having a quick acces water proof storage for small items. The hook capsule retails for $4.50 and you can get it at EDCdepot, only available in black at the time of this review. The clipper is a very small button sized compass from Suunto. It features a liquid filled compass with the cardinal points Marked, the "N',"E","S" and "W" marks are coated in luminiscent material so after exposure to daylight they will glow in the dark. The compass has a rotating bezel with marks every 10 degrees and numbers every 30 degrees, you can use this rotating bezel to know the aproximate direction you are traveling and to perform basic navigation tasks with a map. On the back of the clipper you have a plastic clip that can be used to attach the compass to a watchband, backpack strap, belt, keyring or other objects. The clip has a small dent to prevent accidentally losing the compass; once clipped you need to lift the plastic tab up to remove it, pulling won't be enough. The clipper is quite accurate and for its size it offers excellent results. Certainly one of the best button sized compasses you can get. You can order it from about $10 from different sizes, check froogle's links. And you can read more information from Suunto's official website. 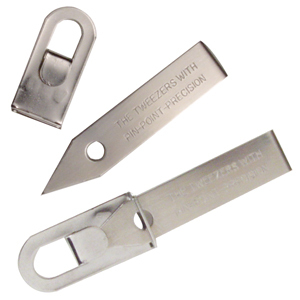 Tweezers are quite useful items in your kit, they can be used to untie rebel knots, remove splints, remove insect stings, pick up very small items like screws and bolts, etc. The normal tweezers you can find in SAKs are useful for many tasks but sometimes they are either too small or too weak for your needs. These tweezers from AG Russell are stronger and much more precise than regular tweezers, they are point-ended to be able to pick very small objects from very narrow places the pin-point precision is a huge difference in many tasks. They come with a small stainless steel sheath that can be put in a keyring so you can remove the tweezers in milliseconds in case of need. If you replace your SAK tweezers with this ones you can use the SAK compartment for a toothpick and have both tools available in an upgraded version. The "Tactical" is a survival capsule from TAD gear that is smaller and has less features or configurations than the Delta model but is much cheaper and very usable. The capsule is approximately 0.88" diam. X 4.24" length and has two compartments, the main compartment where you store your items and a small button sized compartment in one of the ends that can be used to store a button compass, a pill or another small and flatish object. One of the caps has a lanyard hole that can be used to thread cord as big as 550 paracord to carry the capsule in a neck lanyard or hanging form a backpack. The basic package includes: Glow Cord for Neck Lanyard, Emergency Mini-Candle, Matches, a liquid filled brunton compass & Tinder-Quik. You can add a TAD Gear's OS nylon sheath for an additional $7.50 (retail value $16 without the capsule) you can also add a Spark Lite fire starting device. The capsule is constructed in HA-III aluminium with a gray finish; the built quality is excellent. The primary compartment is 2.6" deep with an inside diameter of about .575" Both end caps have scallops machined into their tapered ends to aid in installation and removal. The endcaps are interchangeable and will fit on either end. The "Fast Thread" design refers to the fact that the threads have 3 starting points instead of one, so you'll catch the threads within only a 3rd of a revolution than 'finding' the one starting point when you install the endcaps. This makes the endcaps quicker to put on. Solvent-resistant O-rings on the body compress when the end caps are installed for a water-tight seal. In terms of what you can carry the capsule is certainly small for several items, specially in terms of width but you can use it to carry small objects like tinder, a fire starter, mini pen, mini glow stickie, band aids, currency, pins, needles, pills, tweezers, nylon cord and other smallish items that can be useful in case of need and can be lost in bigger cases. The capsule is compatible with the Delta model so if you have both you can combine delta modules and caps with this capsule. You can also order the X-Acto end cap accesory that was conceived for the Delta model but is compatible with the "Tactical". There is also a small threaded hole in one of the caps that is intended for extra accesories to be announced, the modularity and ability to expant with extra caps and accesories is one of the great things that makes this capsule different than others in the market. The price for the "Tactical" is $58 and you can order from TAD Gear. Update: The 3.0 version of this capsule is now $34 from TAD Gear with just minor cosmetic changes to the one reviewed here. Fauxtons are very small and inexpensive keychain lights. They feature a 5mm led powered by one CR2032 coin cell battery or two CR2016s depending on the model and led color. 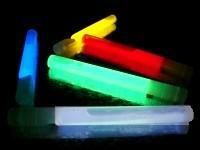 They can be obtained in white, red, blue, purple (near UV), yellow or green leds. There is also a multi-color led variation with a led that changes colors when turned off, nice for parties or eventually could be used for signaling. The case can be either black or translucent-white for the white led version: for the color leds the case is a translucent plastic with the same color tone as the led, blue case for blue led, etc. There are no additional features besides the on/off but you have two ways to turn it on, you can either squeeze for momentary activation or use a small slider switch for constant on. The runtime is very good and the brightness is more than acceptable for the size and price. For keychains or backup lights attached to many different items this small flashlights are a great option and for $1 you can't be dissapointed. You can order them from LightHound. Designed by Mel Pardue the Mini Griptillian is one of the classic EDC knives and certainly one of the most popular models for EDC carry. 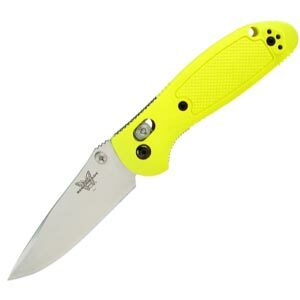 In this review we tested a 556y combo edge knife with yellow handles. The 556 is a 2.91'' blade featuring 154CM stainless steel, it is very sharp, keeps sharp and is very resistant to use and abuse. The opening mechanism uses thumbstuds and the locking mechanism is Benchmade's trademarked Axis lock, among the most reliable and secure locking mechanisms in the market. It was easy to open the knife one-handed and it was also easy to close it with the fingers never getting in the way of the blade. This doesn't happen in many other knives with different locking mechanisms. The grip is very good, the texture on the scales being right to make the knife non-slippery but at the same time confortable to hold without feeling pinched by the scales. 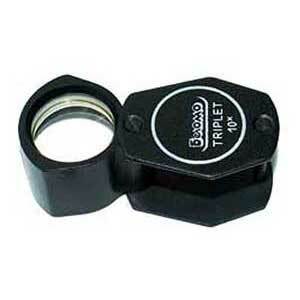 The locking mechanism seems to be more resistant to lint and blockages than linerlocks or framelocks. The 556 included a black pocket clip to carry the knife tip-up. In our tests the 556 opened boxes, cut wood, food and cans without showing signs of wear or damage, the operation is smooth and secure and you can get the feeling that the knife won't quit. There are models in different colors and with different blade types, the semi-serrated blade being great for a general purpose knife since the serrations help in tasks such as cutting rope. A very nice knife for every day use and utility jobs, it can be purchased for about $55 from different vendors. You can read more information in Becnhmade's official website. The GL3 "Commendatore" is a versatile flashlight from Pila flashlights, it can be used with a 9v Xenon bulb or a 3Watt luxeon led head. The light is powered by 3 123A cells or by 2 rechargeable pila 300p batteries. Using the 9v Xenon lamp assembly you get about 1 hour of blasting 200 lumen power, that is a lot more than most of the tactical flashlights made by Surefire or Streamlight. More than enough to momentarily disable an agressor at night, so we can certainly say there is a tactical use for this flashlight. 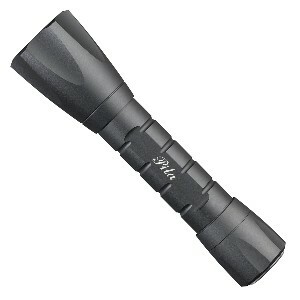 If you are used to the 2 cell flashlights this 3 cell flashlight will provide a big wow factor. If you want to use the Luxeon III head instead you get more than seven hours of 65 lumen light or 3 hours using rechargeables. The tailcap is a simple clickie switch with lockout feature but you can also get special tailcaps that have led lights these led tailcaps in white, red and green are a great addition to the GL3 for tasks that require light but not a mini-sun. The beam is very smooth for an incandescent flashlight, with a lot of throw certainly capable of out-throwing many other tactical lights and it even has a lot of usabel sidespill. The bulb is strong to resist a lot of use. The only small drawback is that if the bulb blows off the tailcap led won't work either so it's not a backup light just a second level brightness for close-up work. The GL3 provides an amazing amount of light for a very accesible price, it has a great collection of accesories and support and can even use rechargeable batteries. At the moment of this review Pila was announcing a Codex module that will be compatible for the GL3 adding multiple brightness, programmable modes, strobes and many digital features to the flashlight, keep tuned for updates. This amazing light can be get for about $65 from JS Burly's website. The 3watt Luxeon model costs about $90. More information at the official website. Specification Chart Here. You can order the led tailcaps for $22 from here. 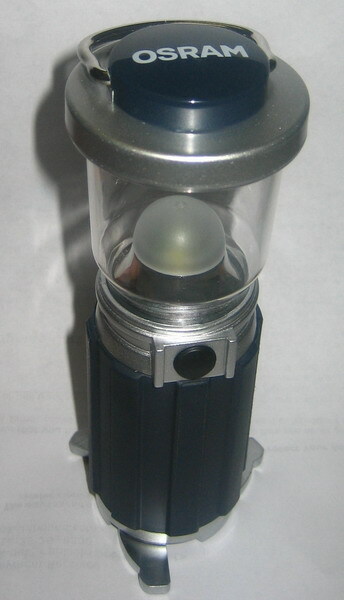 Replacement xenon lamps cost about $18 and can be obtained following this link. Batteries and chargers here.